50 Greatest Gadgets | BlackBerry Blast! PC World has put together their list of the 50 Greatest Gadgets of the Past 50 Years. The Apple iPod, Palm Pilot, Tre600, Franklin REX, RIM Blackberry, and the Poqet PC Model PQ-0164 all made the list. There is a long list of other gadets as well, including the Sony Playstation and more. Check out the link below for the full story. "Canadian firm Research in Motion didn't invent e-mail, wireless data networks, the handheld, or the QWERTY keyboard. 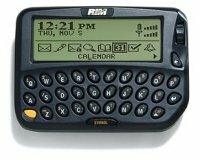 But with the little BlackBerry, along with server software that made e-mail appear on it without any effort from the recipient, RIM put it all together in a way that even nontechie executives could appreciate--and thereby opened the eyes of corporate America to the potential of wireless communications. So addictive that some call them CrackBerries, RIM's ubiquitous e-mail communicators--especially their high-res displays and small yet serviceable thumb keyboards--have forever changed the design aesthetic for personal digital assistants, while their approach to e-mail has become the standard by which all connected handhelds are measured."